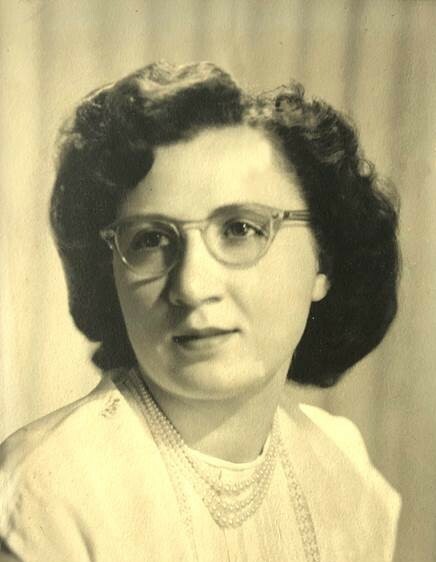 It is with great sadness that we announce the sudden passing of Elsie Buleziuk (nee Ostafichuk) of Winnipeg, Manitoba, with her children by her side on Saturday, April 6, 2019 at the age of 90 years. She is survived by her loving husband Bill of 65 years, son Roger (Wendy) and daughter Della (Scott) Hall; Grandchildren Stefani (Keith), Ashley and Kyle (Chelsea), Tyler (Heather) and Riley and Sisters Mary (Richard) Drewniak and Marge (Orest) Fedorchuk, Sisters-in-Law Mary O’Staff, Edith O’Staff, Freda Buleziuk, Cynthia Halwas, Brothers-in-Law Frank Brewer and Alec Bulbuck and numerous nieces and nephews. Elsie was predeceased by her parents Ted and Lena Ostafichuk, her daughter Debbie and infant daughter Sharon and three brothers George, Lorne and Johnny, Mother and Father-in-Law Rosie & Peter Buleziuk, in laws Eleanor Ostafichuk, Ida Bulbuck, Mary and George Holovach, Nick Buleziuk, Anne Buleziuk, George Buleziuk, Laurie Halwas, Elsie Brewer, Johnny and Valerie Buleziuk and nephews Perry Bulbuck, Ron O’Staff and Gary O’Staff. Mom was born on May 2, 1928 in Lennard Manitoba to Lena and Ted Ostafichuk. She was the second child of six children, a beautiful little girl with long brown hair. As the oldest daughter in the family, she had a lot of responsibilities. Mom said from a young girl of six years old, she helped take care of their growing family as there was so much to do living on the farm back in the 1930’s. Mom learned from young how important family was. She practiced her caring and nurturing ways all through her life and instilled how to love a family unconditionally in her children and grandchildren. In the mid 1940’s, Mom moved to Winnipeg with a couple of her girlfriends, staying with her Auntie and Uncle and then moving into an apartment of their own. She worked in Winnipeg at a restaurant called the Okum Inn for a few years. She was very proud of her job there and how everyone had always complimented her on her delicious pancakes and friendly personality. During her time in Winnipeg she joined the St. Ivan Suchavsky Church and there began some life- long friendships. But Mom was not destined to remain in Winnipeg, as Bill Buleziuk was still out on the farm. She had her eyes set on him from a young girl and as soon as he asked her to marry him in 1954 she left Winnipeg behind and headed back to the farm. Mom and Dad were married on October 10, 1954 in the Ukrainian Greek Orthodox Church in Lennard, Manitoba. They moved into a little house by the valley and not long after into their famous red house on the Ostafichuk homestead. On the farm, Mom raised her three children: Debbie, Roger and Della. She also raised little ducks, geese, chicks, piglets, lambs and calves. She planted three gardens in their yard - one for the potatoes, one for the vegetables and one for the poppies. Their home was always open to anyone driving by that needed a coffee. We were told many times that Mom used to make the best coffee and no matter what time of day or night, you were welcome to stop in for one. She welcomed everyone into her home to stay on the long weekends and summer holidays for all the years they were on the farm. She enjoyed having the family around and always had room for everyone in that small red house. In 1969, they made the hard decision to leave the farm and move to Winnipeg, as they knew it was the right choice for their family. She embraced her new home in Winnipeg and continued to plant beautiful gardens and raise her family. Winnipeg quickly became home and they made many new friends as well. St. Ivan Suchavsky Church became a big part of her life again where her and dad attended service faithfully. They were members of the peroghie-making club, active members with the Executive and she was a part of the Sisterhood. Mom coordinated, cooked for and supervised multiple lunches and suppers at her church. As she got older and could not do as much physical work, she was always the one they called on to supervise the kitchen and explain how to make all the food. Mom and Dad did everything together from grocery shopping to planting gardens to attending various dances. They enjoyed travelling home to the farm every long weekend and every summer. Spending time out there was just something that made them happy. Over the years, mom also travelled to British Columbia to visit her Auntie, to Las Vegas to celebrate her brother’s birthday and to California to attend her nephew’s wedding. She was very excited with this trip as they were able to take all of their children and grandchildren with them and rented a house for us to stay together in. She enjoyed Disney Land and the San Diego Zoo while we were out there. Her last big trip was to Disney World in Florida with Roger and Wendy. Mom was an amazing cook and according to Dad no one could make anything as good as her. She was famous for her peroghies, periske, borscht, homemade bread, cheese rolls and stew, just to mention a few. And Dad always said no one could make fish taste better than her. At any point in the day if you had stopped in to visit them you were guaranteed to be sitting down to a meal with them. Mom was a gracious host when it came to special holidays throughout the year. As young kids our home was always filled with Aunties and Uncles, and nieces and nephews on Christmas Eve, where Mom would make a feast. Ukrainian Easter was the same – she would prepare a fabulous basket and off to church we would go to have our baskets blessed. After church, all the family was welcomed back to her house where she would have a full day of Ukrainian Easter traditions and food. As the years went by and Mom lost her eye sight, the venue changed but Mom still managed to prepare most of the food. So many traditions in our family were built around Mom and Dad. Mom’s house was always the last house that we would all meet at on Halloween. She would be so excited to see the kids in their costumes and always make up special treat bags for them and have the best homemade pumpkin pie waiting for all of us. Christmas morning breakfasts were also always at Mom’s house where she would make her famous pancakes and of course many more things. Once our bellies were full we would open the many presents that would be under the tree. Mom loved those Christmas mornings so much. We were so very fortunate that we were still able to continue this tradition with her right up to last year. But her ultimate happiest times were when she was with her grandchildren. She loved to have them sleep over. She loved to make peroghies with them. She loved to make Ukrainian Easter Eggs with them and have them with her at church on Easter Sunday. She loved to attend their events from watching Stefani, Ashley and Kyle at Ukrainian dancing to watching Tyler and Riley play hockey. She came to swimming lessons, gymnastics and all the grandchildren’s school and sporting events. She was even able to attend each one’s high school graduation. She would always say how fortunate she was to be able to see her own children grow up and then be able to see all her grandchildren grow up into beautiful young adults. Mom had a lot of health issues over her lifetime. More than the average person. But Mom had faith and she fought every health issue with such grace and survived through each one. She knew her struggles mattered and she knew God would give her the strength that she needed. I guess you could say she grew stronger with each ailment. Strong enough to make it to almost 91 years old. She always remembered to be grateful for the life she had as she used to say if you took a walk down the hospital hallway there was always someone so much worse off. Mom was always there for everyone with her caring and compassionate ways and she will be sadly missed by her family and friends for her love, strength, patience and perseverance. How lucky we are to have had someone so special that makes saying good bye so difficult. Dad will be forever thankful for the beautiful life he had with Mom and will miss her dearly.